After struggling to conceive for two years, Lexi and Dillon Udelhoven’s prayers were answered—they were pregnant with not one or even two, but three boys. While overcome with joy, the Winifred, Montana couple also knew they would face definite challenges. Lexi’s multiple gestational pregnancy was considered high-risk, which required Lexi to live within 30 minutes of the Benefis Neonatal Intensive Care Unit (NICU) in the later stages of her pregnancy. Fortunately, the Benefis Gift of Life Housing program offers free lodging to people just like Lexi and Dillon—patients that must travel great distances to receive medical care in Great Falls. As soon as they discovered they were pregnant with triplets, Lexi and Dillon made arrangements to stay at Gift of Life housing. 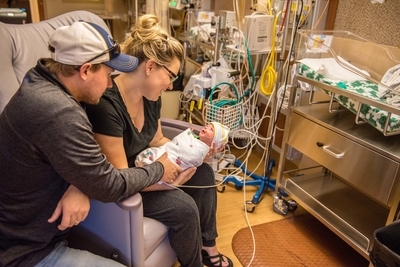 When Lexi was just 25 weeks pregnant, Dr. June Murphy, Benefis Maternal-Fetal Medicine expert and the only specialist of her kind in the region, determined that Lexi needed to make the 160-mile move from Winifred to Great Falls. If not for Gift of Life, the couple would have had to pay for a hotel or apartment, not to mention utilities, for nearly four months. “It’s an incredible opportunity to have these services for free at Gift of Life. To not have to worry about that additional financial strain has been huge. It’s definitely given us peace of mind,” said Dillon. Gift of Life has been a godsend to us. It’s amazing that it all comes from donations. Lexi’s stay at the West Gift of Life Housing Center began on July 9, 2018. “My apartment was homey, spacious, and was fully stocked with everything you could possibly need, which was really convenient,” said Lexi. Dillon and her family members were able to visit and stay with Lexi throughout the summer as they anxiously awaited the arrival of their three baby boys. On August 27, 2018, Trexton, Traylan, and Timmer made a remarkable debut at just 32 weeks. Each baby had his own team of providers ready and waiting, consisting of either a doctor or nurse practitioner, a respiratory therapist, and a registered nurse to help with line placement and immediate care after birth. Although the delivery went smoothly for the babies, Lexi lost a considerable amount of blood and required blood transfusions. She was unable to visit her babies for nearly 10 hours as she recovered. Lexi was grateful to be able to use the NicView Streaming Camera System, allowing her to view their babies in real-time on her phone through a secure online portal. “This was big for me. Even though I couldn’t physically visit my boys, at least I could see them because of the NicView cameras,” said Lexi. The NicView cameras let us check in on our boys 24/7, and we know they are getting great care in the NICU. As Trexton, Traylan, and Timmer received specialized care in the NICU, Lexi remained at Gift of Life for nearly two more months until they grew strong enough to go home. Hardships do not discriminate; all walks of life can be impacted. Donors to the Gift of Life Program will never be disappointed with where their money went. Hundreds of families from across Montana rely on Gift of Life Housing every year. We need your help so patients in need may continue using these free services. Click here to make a gift online to support Gift of Life.